FA Cup Starting Elevens Prediction Special – Decision Time! Welcome to FA Cup Final Thank Bergkamp It’s Friday – This week it is a TBIF with a difference as instead of reviewing the Arsenal week we have simply asked our crew if they want to select their own Wembley 11. We have asked they give us their starting team, the formation and a short explanation. The results threw up a few surprises as you will see. This formation is our big game formation. We used this at OT and we used this at City. It allows us to be compact and closes our distances. If he Ox was fit he would be my right sided player. Again this team can press as a unit but if we have to defend deep we can do this as a collective.Big games are won by a unit, you cannot be open. My preference is for a pressing game and to force Villa into mistakes on the big day. If we allow them to score first it will be hard for us and unlike Hull, Villa have transition speed. I’d play Coquelin as DM. Cazorla in deep playmaker role. Ramsey as box-to-box. Ozil and Alexis as fluid 10s behind Walcott. Giroud as impact sub for Walcott (if he is shite) or Coquelin if we are chasing. Ox and Wilshere to add freshness. Szczesny gets the nod in goal because I feel that Ospina looked very shaky against West Brom and in the past few weeks he has been found wanting on a number of occasions. Szczesny has played in goal since the 4th round and deserves his chance after missing out on the final last year. Playing Ramsey in the middle is crucial to our success as we have looked stronger with him playing centrally. Walcott playing up front is a controversial selection but I think he can rotate with Alexis throughout the game and his pace will cause Villa all sorts of problems. Yes, almost the same side that beat West Brom. Monreal has been very good this season defensively and is more effective with his final pass/ball when going forward. Though I would prefer Jack in the center, Santi’s style of play from the middle will give Jack more freedom to drive, be creative; and, to be fair to the Wilshere, he does go out wide time to time and makes better use of Bellerin than Ramsey. Theo up front to give Villa something new to think about and bringing on Giroud in case it doesn’t work is never a bad option! Lastly, the Pole in goal, well, I know it’s the final but I feel he’ll be up for it and it’ll be the right thing to do. This side was picked weeks ago and dipped in form at a time when the main objective had slipped away (our slim hope of winning the league). Villa have an energetic midfield and the use of Ramsey to drift inside should help us win that battle. He wins the battle over Theo due to his ability to get back. Then it’s just about getting around Giroud and not isolating him. Walcott’s hat-trick is a non-event for me, place on the bench and offer an alternative if needed. I would personally have Ospina on goal because of Wojciech’s form this season and because of his lack of games. Also think that would teach him a lesson for the future. Keeping the defense as is is crucial for it brings stability to the whole team, plus Bellerin and Monreal have been superb this season so they deserve a starting place. In midfield, I was a little hesitant to have Ramsey in the middle and include Wilshere as well, but believe keeping Coquelin and Cazorla would give the stability needed in a game like this. Alexis, Ozil and Ramsey provide the attacking mid/wingers space. Ozil and Ramsey can drop into midfield and let Alexis roam right in front of them. Ramsey’s best position definitely isn’t on that right hand side, but he gives protection to Bellerin and can keep an eye on Agbonlahor’s pace with his energy and stamina. Finally I would play Theo Walcott up front against Aston Villa. Their defenders arent the fastest and they will be expecting to face the more physical Olivier Giroud, which thry wont mind. Playing Theo in front and having Alexis Sanchez roam around him opens up the Villa defense and can easily help Arsenal win the game. Arsene can later introduce Giroud and Wilshere if things arent going as planned. Lets hope the players perform on the day and we retain that FA Cup! 10 of the 11 pick themselves for me and the only real debate is Theo & he gets the nod over Ramsey/Wilshire on the right for 2 reasons. 1- Momentum – prior to Baggies the team had stagnated a bit, maybe it was end of season blues, maybe fatigue. Theo came in and took his chance & has momentum after scoring his hat trick. 2- Fluidity – If Theo is disciplined, he can assist Bellerin in defence and join Giroud in attack providing a totally different dynamic to just Olivier. I expect a compact and energetic Aston Villa on Saturday; they are likely to play long balls towards Benteke or exploit counter attacks in case we lose the ball in dangerous zones, I would therefore make sure Coquelin patrols our third and slides to each side to cover our full-backs, if needed. Since we need to control the ball, I would play Cazorla and Özil in the middle, with Ramsey winning his place back despite Wilshere brilliance against WBA; the Welshman guarantees a huge contribution at both ends of the pitch, although the right-wing spot doesn’t really suit his skills. I would play Walcott upfront and use Giroud from the bench because I believe the Englishman can make more damages to a very static defensive line. Talking defense, Szczesny should start like Fabianski did last year and Bellerín must keep his place for what he showed recently; I expect Koscielny to be back and partner Mertesacker through the middle, not Gabriel: the Brazilian has been good but Mertesacker calmness could be vital in a Final. Finally, Monreal should complete the back-four and Alexis is undroppable in my opinion, so here is my line-up explained. – Most favour Ospina in goal and I think the fact that Wenger has not given Woj a run out makes them right. – The same back 4 has been selected by all 8 writers and who would have thought that case with no Gibbs or Debuchy at the start of the campaign. – All 8 writers selected Francis Conquelin. – Only 2 writers selects Ramsey in his preferred central berth and 3 don’t select Ramsey AT ALL! – There are 7 players who make all 7 11’s, the back 4, Coq, Ozil and Alexis. – All 8 place Alexis on the left and none therefore have him on the right where I would like to see him taking on the left back on the outside. 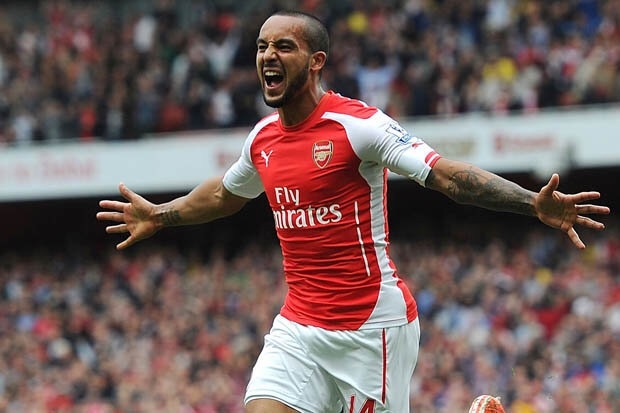 – 5 of our writers have been convinced by one stellar performance from Walcott and start him as the main striker. – It is likely that only Kos, Per, Santi, Ozil and Ramsey will survive from the 2014 Cup Final staring 11 which is quite astounding. Memories of Ryan ‘Rocky’ Rocastle Arsenal FA Cup Final Mascot 2001 – Exclusive!